the movement involves mobilising people with Walkmans to a busy commuter station at rush hour. By dancing alone to their favourite tunes in an unlikely environment, the event aims to challenge perceptions of public space while inspiring people to let their hair down. Actually, we were doing this back in ’93. Though we weren’t using phones or walkmen, we were still ahead of our time. Umm–are you in this picture? Looks like epileptic frenzy–probably normal for tube hangout time. I like the underground in most cities–always some nefarious or unexpected activity going on whether you are in Berlin, NYC, etc. Not that I doubt you, but if you digitally added the arrow, how is one unacquainted with you to know that you didn’t digitally add the date? Sassy J, I am not in the picture (I took it). 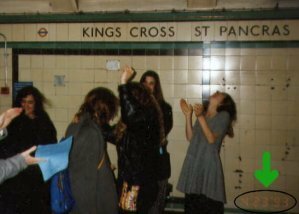 It was less of an epileptic frenzy and more of a drunken decision to dance at all tube stops, getting back onto the train before the doors shut. DCA, there’s no way I can prove that I didn’t Photoshop the date. Moon Pappy–if you’re reading, please testify that the date was on the original photo when you scanned it. Moon Pappy here. I can testify if so needed, that indeed the photo was dated as taken on 4’23’93. I can further stipulate that it was scanned on 6/14 in the year of our Lord 2004 and was emailed to Becky at 9:19PM and finally sucessfully 6/15 at 13:09. As to what they were doing at the time it looks like there were in the midst of a “Pub-Crawl” and missed the train. I suspect music was provided by the underground street musicians, or was it in their collective heads? hey wether or not you where doing it back in the day or not we’d love you to come join in the next Mobile Club Tuesday 6th July at Paddington Station 18.18, show us how you where doing it back in the day if you wish, whatever your wonderful moves will be warmly welcomed and i’m sure put some smiles on a few miserable commuter faces as that is what its all about.